Help make the CGCC Concert Choir dream performance come true by attending a fundraiser performance featuring John Rutter's "Requiem” tomorrow at 7 pm at the Velda Rosa United Methodist Church in Mesa. 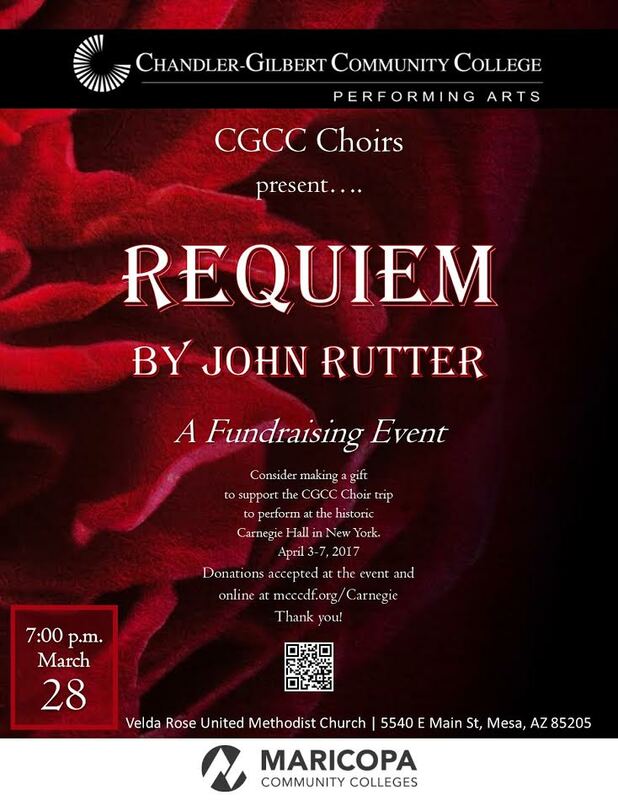 Funds raised at the event will benefit the choir’s upcoming performance at the world-famous Carnegie Hall April 3-7. Last fall, the CGCC Concert Choir was invited to attend the Mid-America Productions Spring Festival Chorus at the distinguished in Carnegie Hall in New York City. As one of only four choirs in the nation to receive an invite, this honor arguably places CGCC among the leading concert choirs in the U.S. Since receiving the invitation, choir members have been diligently raising funds to pay for the cost of the $72,000 trip. Last month, Southwest Airlines donated round trip airfare for each choir member making them one step closer to achieving their goal. We hope you can join us for this wonderful event. The Velda Rose United Methodist Church is located at 5540 E Main Street Mesa, AZ 85205.